The Vegetarian Who Eats Bacon – Olive For Greens. When people find out I am a vegetarian this is what I usually hear: “I thought about becoming a vegetarian, too. 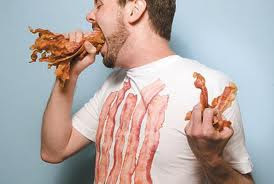 But…” Or “I would be a vegetarian but I like bacon (or fill in your blank) too much!” My response- Then be the vegetarian who eats bacon or chicken or fish! That is as simple as that and, trust me, its fine. Whoever says it is not, is a fool. Here is why. As I’ve mentioned before, this is a lifestyle. If you decide to cut out every kind of meat except chicken, you are already off to a good start with a healthier lifestyle. The reality of the situation is, you will not eat chicken single day. As humans, we get bored with the same ol’ same ol’. Yes, even those of us who are creatures of habit. What it all boils down to is a label. Labels are society’s safety nets. Stereotypically, people feel more comfortable when there is a label on something (or someone). If you really want to put a label on yourself, proudly call yourself a Vegetarian who eat chicken, for example, or a Pollo-vegetarian. How about a Faux-vegetarian? Exhausting, right? Could be. At the end of the day, we answer to ourselves. Therefore, all of the chit chat that goes on throughout the day is silenced. And if someone gives you a hard time about your diet, don’t sweat it. Nine times out of ten, you will be happier (mentally and physically) than that person in the long run. The only labels I prefer are the one on packaged foods. Meatless Monday began in 2003. Yes, this is real- I did not create Meatless Monday. Meatless Monday began is a global movement attempting to reduce health risks in people around the world and our planet. (click here to learn more) Most people don’t know how to not eat meat. For the vast majority of us, we grew up eating meat. A balanced dinner has to consist of meat, carb and a veggie, right? Wrong. In fact your dinner plate does not have to have meat, or protein, on it at all. It is called a balance diet not a balanced meal. Right? Since becoming a vegetarian I pay more attention to my daily essentials than I ever had. Sometimes I ask myself if I had enough protein or calcium or vitamins throughout the day. Before, I never thought twice about it. Maybe you’re an Omnivore and are reading this or a new found veggie head. Do you agree? What better way to set the mood right than showing how to make some good ol’ facon? I LOVE BLT’s. Seriously, I ate them all of the time for lunch or brunch. This a great recipe that can be enjoyed outside of a sandwich with pancakes or whatever else you like! Tip: Use a long knife. When cutting the tempeh, cut in half (so there are 2 pieces in front of you). Then cut those pieces in half (so there are 4 pieces in front of you), etc. Lay tempeh slices in 2 13- x 9-inch baking dishes. Bring tamari, vinegar, syrup, cumin, chile powder, cayenne pepper and ½ cup water to a boil in small saucepan. Boil 1 minute, then remove from heat, and stir in liquid smoke, if desired. Pour over tempeh slices. Let cool, then cover and chill 30 minutes, or longer. Preheat oven to 400°F. Line 2 baking sheets with parchment paper. Carefully transfer tempeh slices to prepared baking sheet, and discard marinade. Brush slices with coconut oil. Bake 15 minutes, or until beginning to brown. Flip tempeh slices, brush with oil, and bake 10 more minutes, or until crisp and dark brown. Note: After I flipped the tempeh, I baked for 15 instead (for more crisp), hence the dark color in the photo. Toast the gluten free toast. Layer lettuce, tomatoes then facon on top. Add your usually sandwich additions such as mayo, mashed avocado or organic ketchup! Next Post Are you nuts?! Pingback: Coconut Bacon – Olive For Greens. Pingback: Vegan BLT – Olive For Greens.